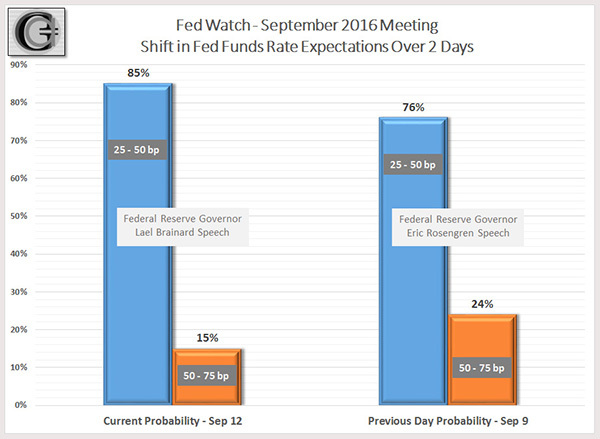 Federal Reserve to shift out any monetary policy change to December or beyond. A pre-emptive increase can turn the intended medicine to poison. Volatility to remain elevated and some consolidation to occur. At this time US stock allocation should be maintained. The excerpt above from our market outlook article in early August, presented a case for ongoing exposure to stocks, acknowledging that September can be a volatile month as the market consolidates. There is no change to this outlook. Investors should consider staying the course and maintaining their exposure to stocks. That strategy since March 2016 has served us well. The probability of an interest rate increase, perhaps as early as September, spiked following a speech by the Federal Reserve ((FED)) Bank of Boston voting governor Eric Rosengren last Friday indicating that he is in favor of higher rates. Fortunately for the markets the anxiety of an imminent rate increase did not last too long. Another voting member, Federal Reserve Governor Lael Brainard, in her planned speech in Chicago, provided offsetting arguments in maintaining the status quo on interest rate policy at the next meeting. The comments were soothing to the market as it dampened-down the market expectations of an interest rate increase at the FED meeting on September 20-21. Since our last article, much of the economic data that has been released has come out in favor of not raising the Federal Funds Rate band at this time. The two most significant reports have been the GDP report and the Non-farm Payroll report. The second quarter revised GDP or "second" estimate of 1.1% was below the initial "advance" estimate of 1.2%. Pending the final reading later this month, the economy most likely grew around the 1.1% level. A shaving of GDP growth doesn't stoke the argument for an increase in rates, particularly with the average growth levels below 1% for past three quarters. As we had pointed out in our earlier article, nonfarm payroll employment was an indicator that had the potential to bolster the case for a near-term increase in Federal Funds rate. The August reading held importance in terms of its weight in policy calibration, and also to determine if the strong reading of the prior two months could be developing into a trend. As depicted in the chart above, the August payroll report was a bit of a downward surprise with the growth of 151,000 jobs coming in below a consensus estimate of 180,000, with the gains in services sector jobs being offset by declines in manufacturing and construction sectors. The highlight was the upward revision in July to 275,000 new jobs. Even though it was a positive report, it was not the kind of report that bolsters the case of a steaming economy requiring to be reined-in with higher interest rates. These two key pieces of economic data have been supplemented further by some key leading indicators, all suggestive of an economy that doesn't appear to be on a clear growth path. The ISM's Purchasing Managers Index ((PMI)) for August was reported on September 1. The reading came in at 49.4, well below market expectations of 52. Of greater concern was the fact that the reading was below the critical 50 baseline, which generally suggests a contracting manufacturing sector, with New Orders, Production and Employment, all contracting. This was the lowest reading since January 2016. Similarly, the ISM's Non-Manufacturing Index also fell to 51.4 in August from 55.5 in the prior month, and well below expectations of 55. This was the lowest reading since early 2010, as New Orders, Activity and Employment showed a slowdown. Consumer sentiment continued to inch lower. After touching a high in May at 94.7, the index has been slipping each month and was at 89.8 for August. 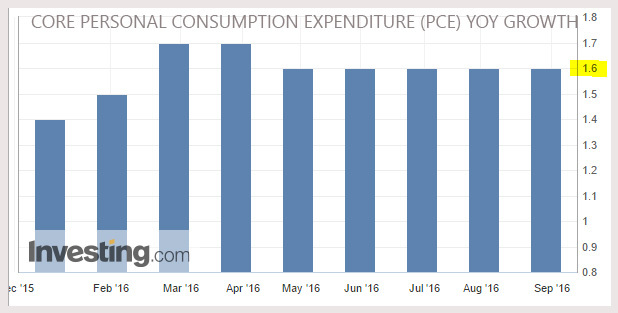 At the same time, growth in the Federal Reserve's key measure of inflation, the Core Personal Consumption Expenditure or PCE, was reported last week. The reading for July came in at a year-over-year (YoY) growth rate of 1.57%, very much in-line with recent readings, and notably well below the 2% target rate that the FED prefers. For all the above economic measures, one reading doesn't make a trend. But taken together in combination, it creates a mosaic of an economy that is grinding its way forward without any risks of inflation, and on the contrary keeping a potential deflation threat on the horizon. Such an economic backdrop is not indicative of one where the Federal Reserve will be inclined to move the rates higher imminently. The risk of pushing the economy into a recession are just as important to avoid and perhaps more so at this point, then controlling non-existent inflation. Pursuing the idea of prolonging the recovery by preemptively raising rates near-term, may spur a situation where the intended medicine becomes the poison. We believe there is a higher probability of a rise in interest rates in December, and that too if the economic data improves from the readings received so far in September. Very important, the milder economy data does not suggest that the economy is losing speed rapidly or worse, tanking, which is the most prominent reason for corrections and bear markets. For stocks, the present situation may be a sweet spot where the economy is neither too hot nor too cold, thus minimizing the need for monetary policy intervention. We believe investors should maintain their allocation to stocks heading into the final quarter, recognizing that volatility will remain relatively enhanced compared to July and August. 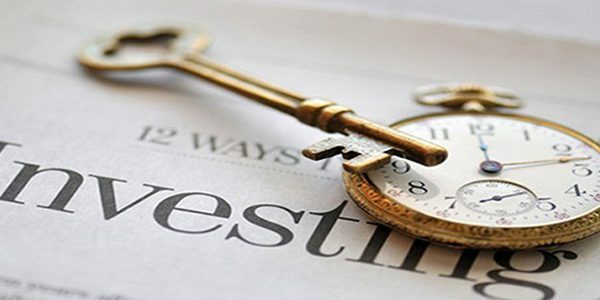 The biggest risk to valuations at this time is more political than economic, as unexpected election results or a meaningful change in status quo within the US government can elevate uncertainty, volatility and risk-averseness. We believe third quarter earnings should provide support for stocks valuations. In the meantime, the stock market should keep climbing the wall-of-worries, as it has for much of the year, and we anticipate the markets to reach new higher ground in the late October/November time frame. We continue to maintain stock exposure in our recommended Small-cap and Biotech portfolios, which at up +48% and +3%, respectively, are well-ahead of relevant benchmarks. The rally thus far, has not been driven solely by the FANG stocks - Facebook (FB), Amazon (AMZN), Netflix (NFLX), and Google (GOOG) (GOOGL) - but has been more broadbased with companies like Intel (INTC), Netapp (NTAP), Microsoft (MSFT), Adobe (ADBE), Sap (SAP), and Momo (MOMO), to name a few, participating as well. Despite the political issues engulfing the healthcare sector, stocks like Amgen (AMGN), Seattle Genetics (SGEN), Exelis (EXEL), Nektar (NKTR), Ariad (ARIA), Medivation (MDVN), Exact Sciences (EXAS), and Tesaro (TSRO), to name a few, have gained ground. Recently, even China related ADS stocks have discovered renewed momentum with Weibo (WB), Netease (NTES), Alibaba (BABA), and Sina (SINA) performing strongly. Even ETFs can be used to acquire rapid exposure with S&P 500 (SPY), Nasdaq (QQQ), and Russell 2000 (IWM) providing a broader exposure. We believe this is a time to stay the course. If you wish to add to this article or share your viewpoint, please leave a Comment for everyone's benefit. Thanks!